OVERLAND PARK — People of all ages banded together on a cold Palm Sunday to bring attention to pro-life. The group was a part of the LIFE Runners A-Cross America Relay, a running/walking event designed to create awareness for the unborn and abortion. Participants, led by LIFE Runners co-founder, president and CEO Pat Castle, donned blue jerseys emblazoned with the words, “REMEMBER The Unborn – Jer 1:5.” LIFE Runners is the largest pro-life running/walking team in the world, with over 7,300 members across 129 chapters in all 50 states and 34 nations. The annual relay began on Ash Wednesday, kicking off in San Francisco, New York, North Dakota and Texas (forming a cross over the United States), before converging in Overland Park. Covering 5,359 miles, participants ran 5K legs on the route or stayed close to home and participated remotely in their local area. The relay route passed by abortion facilities throughout the United States. The Overland Park event began with a Mass at Church of the Holy Cross in Overland Park and concluded with a peaceful prayer gathering at Planned Parenthood. The Holy Cross Knights of Columbus provided participants with lunch. Eudora resident Tina Jinkens, 48, participated in the relay for the first time. Jinkens is blind and ran alongside her guide dog Clara, who was trained to be her running companion. A member of Holy Family Parish in Eudora, Jinkens has been involved in pro-life work for 20 years, starting in college. It’s a cause she says is especially meaningful because of her own disability and that of family friend Joe Steffy. Steffy is a young man from Louisburg who has Down syndrome and recently joined LIFE Runners. Jinkens volunteers for the Gabriel Project, a ministry of the pro-life office of the Archdiocese of Kansas City in Kansas. It provides help to pregnant women in need. Just days before the relay converged in Overland Park, Jinkens and Clara ran multiple legs of the relay in Lawrence and Eudora. 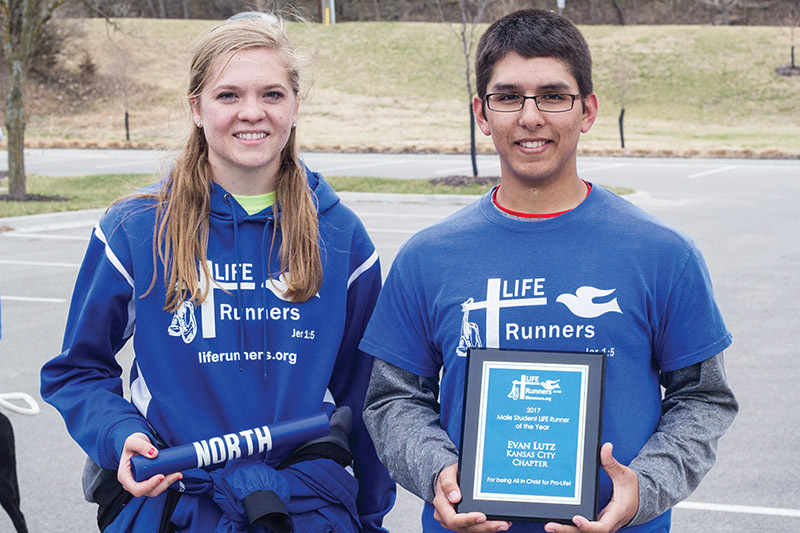 This is 17-year-old Evan Lutz’s second year as a LIFE Runners participant. Lutz, a Garnett resident and Anderson County High School junior, is the 2017 LIFE Runner Male Student of the Year. A member of St. Boniface Church in Scipio, Lutz was inspired by a family from his youth group. Tremble, Missouri, mom Paige Marta participated in the relay with her 11-month-old daughter Abigail, while 14-year-old Alexa Lamb of Jefferson City, Missouri, participated with her family. Lamb is the 2015 LIFE Runner of the Year. “I’m defending the children who don’t have a voice, and I need to be that voice,” Lamb said. According to Dorrell, 82 percent of women who chose to have an abortion have said that just one supportive person would have changed their mind.